This guide demonstrates how to make your software discoverable by other applications in C#. It is really useful if you are going to build a more complex application which requires the a live streamed video as a resource. When using software for the first time, discoverability is important. It let's the other software to recognize your software's capabilities and communicate with it. Therefore you will be able to create applications that work together with your other programmes instead of working separately. 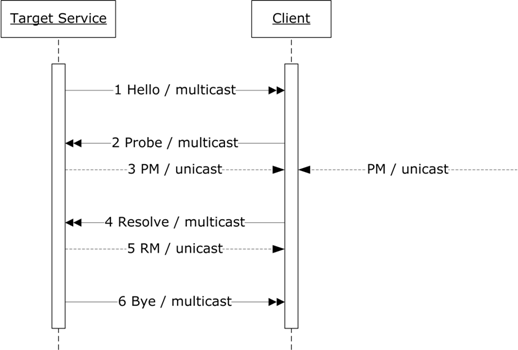 This specification defines a multicast discovery protocol to locate services. The primary mode of discovery is a client searching for one or more target services. To find a target service by the type of the target service, a scope in which the target service resides, the client sends a probe message to a multicast group. In response target services that match with the probe send a response directly to the client. To locate a target service by name, a client sends a resolution request message to the same multicast group, and again, the target service that matches sends a response directly to the client. To scale to a large number of endpoints, this specification defines multicast suppression behavior if a discovery proxy is available on the network. Specifically, when a discovery proxy detects a probe or resolution request sent by multicast, the discovery proxy sends an announcement for itself. By listening to these announcements, clients detect discovery proxies and switch to use a discovery proxy-specific protocol. However, if a discovery proxy is unresponsive, clients revert to use the protocol described herein. To support networks with explicit network management services like DHCP, DNS, domain controllers, directories, etc., this specification acknowledges that clients and/or target services may be configured to behave differently than defined herein. For example, another specification may define a well-known DHCP record containing the address of a discovery proxy, and compliance with that specification and may require endpoints to send messages to this discovery proxy rather than to a multicast group. While the specific means of such configuration is beyond the scope of this specification, it is expected that any such configuration should allow clients and/or target services to migrate smoothly between carefully-managed and ad hoc networks.